“When she speaks, her words are wise and she gives instructions with kindness” (Proverbs 31:26). New Life Baptist Church’s Woman Sunday School was started by a few women who were longing to grow in Christ. By God’s grace, we are thankful that this group is slowly growing. We are a group consisting of active energetic grandmothers, mothers, and wives who are passionate to study the word of God. Through this study, our hope is so that we may grow together in humility – not only in knowledge and understanding of God but more importantly that we may grow in our personal relationship with Him – our Savior. In addition, as a body of Christ, we realize it is vital to support each other in prayer and in action. For this reason, every month we dedicate a time to pray for each other – our family, our friends, and our church. Through the sharing, we are blessed, encouraged and learned from each other, i.e. life struggles, parenting, and marriage etc. and the best part – we laugh together too. Every quarter, we would organize “Ladies Tea Time” where we discuss various real life challenges topic we face as women today while enjoying favorite snacks. Every so often, this can also be fun activities led by talented woman, ranging from flower arrangement, cooking lessons, fashions and many more. 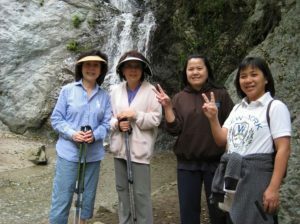 We have also organized woman outings event to strengthen our friendship and to escape from our “mother/wife” duties for a while and appreciate the beauty of outdoor nature God has given us. Come and grow together in Christ likeness!